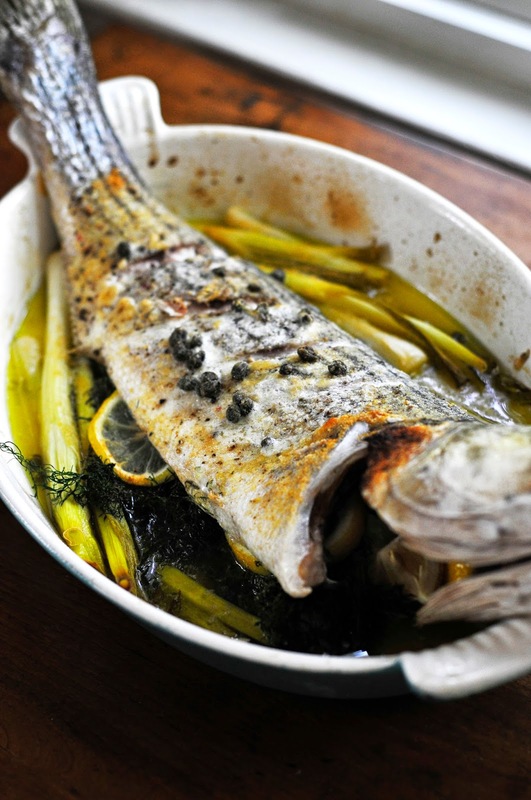 I have lived in Maryland for three years and in this time I have baked, grilled and poached more whole fish than ever in my life time of cooking in the kitchen. I love the experience that a whole fish brings to the table for my family. It touches on our senses: the smells are vibrant with the scent of the ocean, the visual beauty of a whole fish is exciting for the kids to see, the ability to touch and debone the fish at the table is once again, an exciting venture for our guest to enjoy and finally the ooohs and aaaahs that escape the mouths of friends and family are music to my home chef ears. Rock Fish is a local fish that is caught in the Chesapeake Bay. We eat a lot of this fish in the summer time. I find the fish to be mild in flavor. Not too firm to the touch. A great fish to eat, use in fish tacos, or serve as individual steaks. 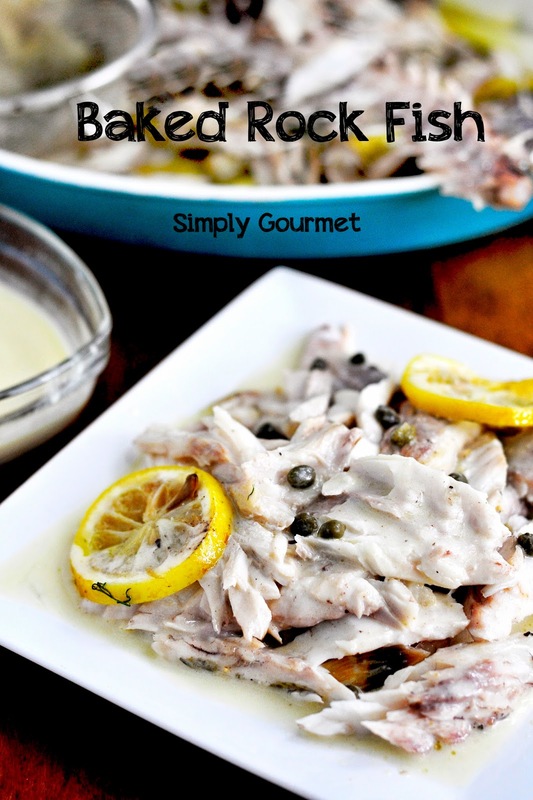 For this dish I layered the flavors to create the lemony sauce that I made from the melted butter, steamed green onion, lemon, capers and of course, any juice the Rock Fish provided during the baking time. I have a few more whole fish recipes coming in the near future. I recently bought a whole Red Snapper and grilled that on our BBQ pit. When I buy my whole fish I try to buy it as fresh as possible. In fact, if you know anyone that goes fishing, ask if they would sell you one, give you one or barter with you. Living by the water we have fish markets that get fresh fish daily so this is easy for my family to find the freshest fish possible. I usually have them remove the scales and gut the fish for me. I will trim the gills when I get home. I find this is the easiest for me but you are always welcome to do this task at home. The great thing about fish is that there are an array of herbs and spices to choose from when baking or grilling your whole fish. Each time I make a whole fish I mix and match what I have in the refrigerator. 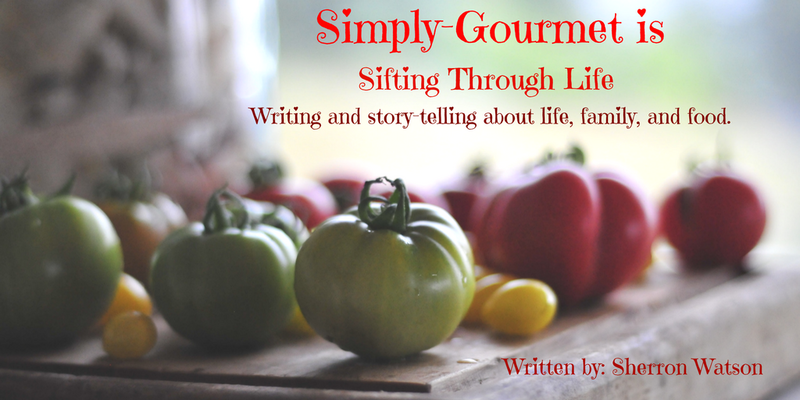 Some herbs that I have used are dill, thyme, mint and flat parsley. I like to use citrus. Sometimes its lemons, limes or grapefruit. I like capers a lot and of course butter or ghee always make an appearance. 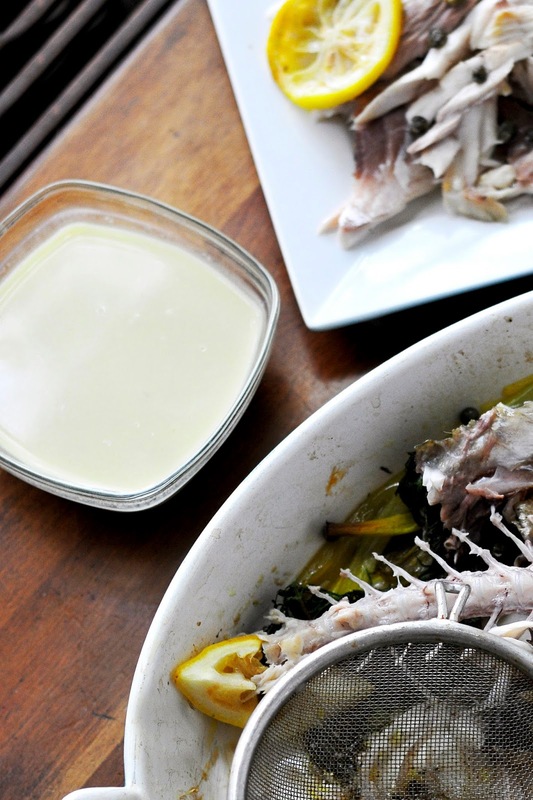 This is an easy recipe and the fish and sauce have rich flavors and make a lovely dinner. 2. 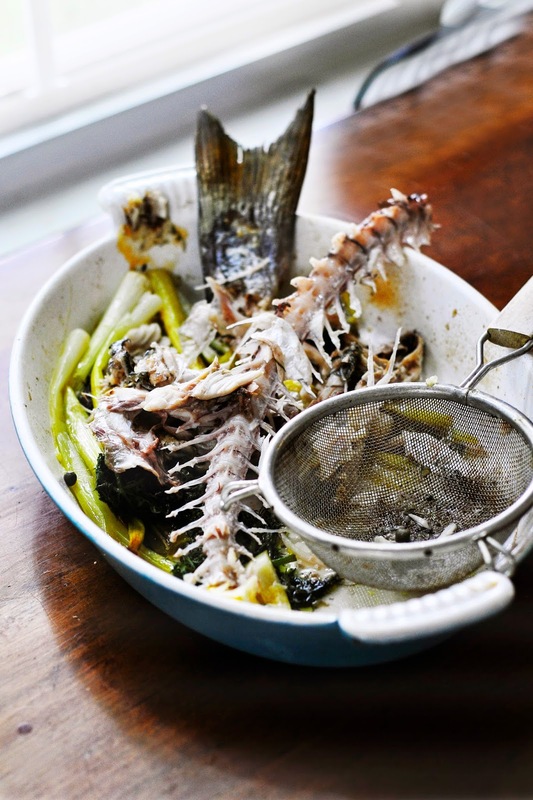 In a baking dish (oval or rectangular-large enough to hold fish) lay your fish across dish. My head and tail hung over abut 2 inches on each side and did not cause me any problems while baking. 3. Use a sharp knife and cut 4 slashes across fish. In each slash place a sliced lemon. Around the fish add the dill and green onion. Squeeze half a lemon over the top of the fish. Add the salt, pepper and garlic salt. Sprinkle the capers. Add the tablespoons of butter. (see picture) Finally add the water. 4. 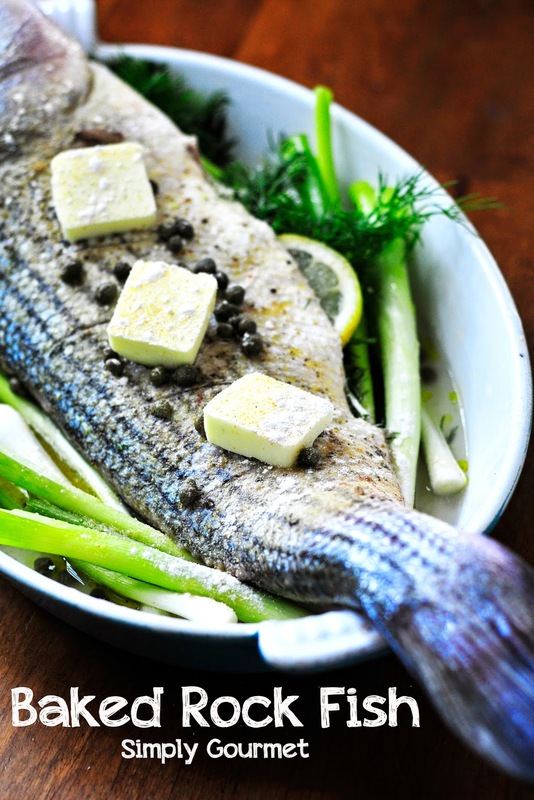 Place in oven uncovered and bake until fish is firm to the touch, 25-30 minutes. Remove from oven and pour broth into a small sauce pan. Reduce the liquid for 5 minutes by bringing broth to a boil and simmering. 5. When sauce has reduced add cream or coconut cream to the sauce. Stir and taste. Make any adjustments based on your taste buds. 6. 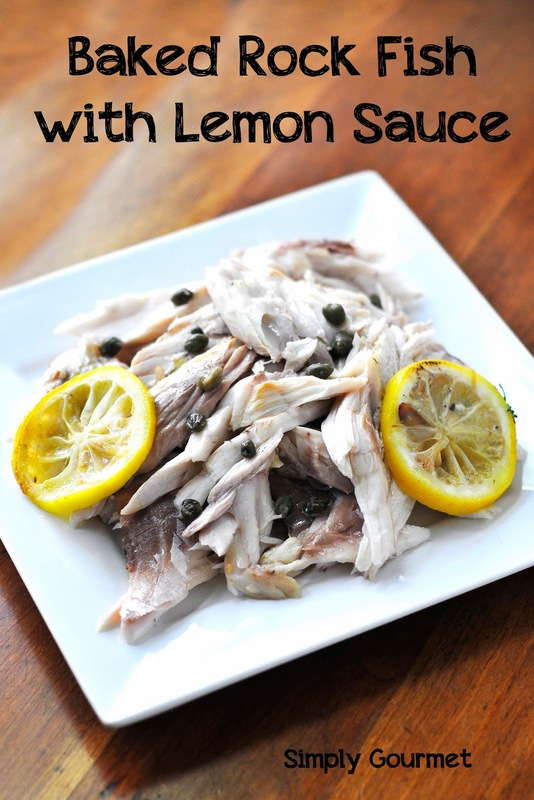 I gently removed the fish from the bones to a small plate, added a few more capers and lemon slices. Poured the sauce over the fish and served with steamed vegetables and rice. The sauce can always be served on the side.